Early-spring snow can be a foot deep in northern Vermont, but in the hoop houses at Bread & Butter Farm, kale and spinach plants are tucked under an extra “blanket” of row cover. About 1,400 miles away, spring is quite a bit warmer in the Arkansas Ozarks where anemones and ranunculus bloom alongside greens like bok choy and chard in the six hoop houses at Dripping Springs Garden. Further west and 7,000 feet up into the San Juan Mountains of Colorado, hoop houses at Indian Ridge Farm protect salad greens and provide shelter for the overwintering laying flock. The hoop house, also called a high tunnel, has become over the last decade a valuable tool for organic farmers across the United States. Constructed from a tubular steel frame covered in heavy-duty plastic, it’s a type of passive solar greenhouse in which crops grow directly in the soil but are sheltered by the structure. With no artificial lighting or temperature controls, a hoop house is relatively inexpensive to buy and operate. cost-sharing commitment of $93 million. Cold-weather season extension may be the most obvious use of hoop house production, but this kind of low-input, sheltered agriculture delivers many other benefits. Hoop houses protect plants from weather extremes like hot sun, wind, and storms; help prevent many disease and pest infestations; and enhance the quality and yield of specific crops. What’s more, they enable farmers to cultivate high-value items, such as grapes, dwarf fruit trees, and hops, outside of the climate zones where they’re usually grown. In Huntsville, Arkansas, partners Mark Cain and Michael Crane put up their first hoop house 15 years ago to enable them to grow pricey flowers—like lisianthus and lilies—that struggled outside. During the summer, Dripping Springs Garden’s hoop houses protect vulnerable crops like sweet peppers and tomatoes from excessive sun and direct heat; they have even sheltered semitropical crops like ginger root. 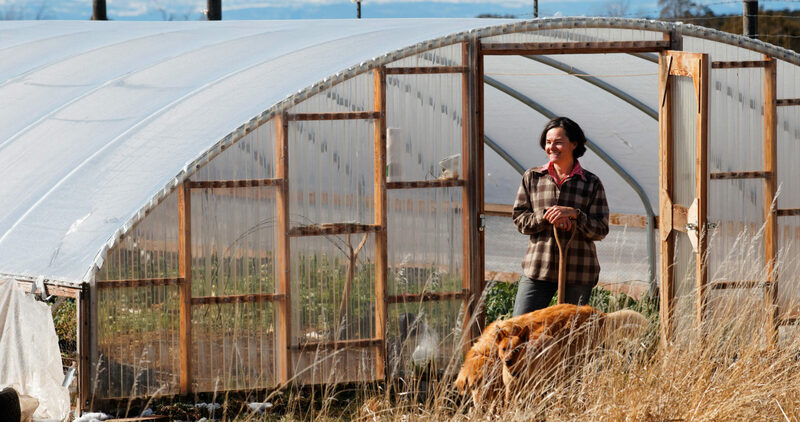 And in the mountains outside Norwood, Colorado, hoop houses are critical to the success of Indian Ridge’s high-altitude vegetable cultivation, says farmer Barclay Daranyi. In addition to having them house winter greens, Daranyi and her husband, Tony, use them to start crops such as tomatoes and eggplants earlier than their location would typically allow. “We also get more solar radiation because we’re closer to the sun, so we use shade cloth on the hoop houses to help with that,” she says. Depending on size and style, production-scale hoop houses can cost between several thousand dollars and around $15,000 to install. “It’s important to focus on the highest-value crop you can grow in them,” says Cain. Both Cain and Pierce note that although the winter market for locally grown produce is less competitive than the summer one, staying in business during the slower season gives farmers a chance to capture loyal year-round consumers. Growing inside shelters also allows farmers to offer the earliest strawberries or tomatoes at premium prices. 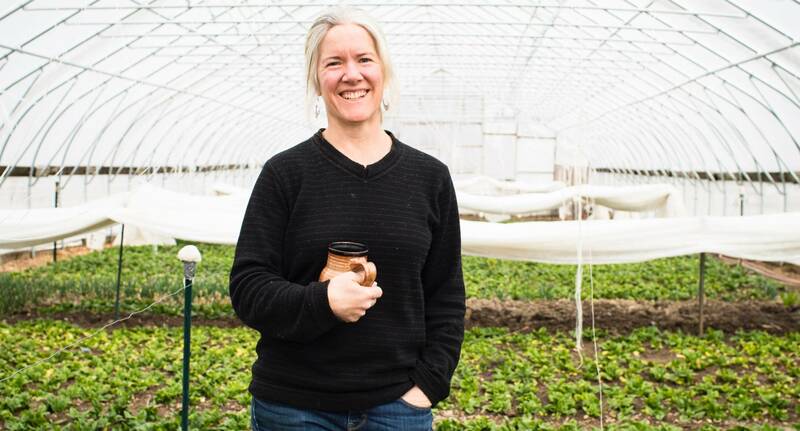 Pierce leveraged demand for winter greens into a unique partnership: An independent grocery store provided a short-term, low-interest loan so Bread & Butter Farm could build a hoop house in exchange for feeding the store a steady supply of greens. At Dripping Springs Garden, hoop houses provide wind protection and shade that help flowers grow stronger, longer stems before they bloom, significantly increasing their market value. For small farms, a single-bay house with either a Quonset- or Gothic-style roof, each designed to withstand snow and wind in different ways, is a sensible structure to start with. The NRCS cost-sharing program has required farmers to purchase a manufactured kit, but you can also find build-your-own plans. Secondhand hoop houses may be available, but, Pierce warns, they can be more work than the savings are worth. When deciding on size, plan enough space for both farmers and plants to coexist comfortably. The ideal site is relatively level ground with good drainage and healthy soil, although it can be amended with a cover crop in advance of construction if needed. Access to an all-season water source is critical. With your geographic location and planned seasonal use in mind, orient the structure for optimal sun exposure in winter, but also be mindful of potential overheating in summer. Awareness of known wind currents can also help you position your hoop house for the best ventilation and protection from weather damage. Indian Ridge’s mesa-top location, for instance, sees such high winds that the farmers poured concrete footings for the cross-braces, but most sites will not require that. (Note that any permanent construction could have tax implications; hoop houses are normally considered temporary structures.) Although too much wind can be destructive, adequate vents and roll-up sides are essential for good air circulation, which will keep moisture and heat under control, Daranyi advises. After setting up your hoop house, take the time to lay out the beds to maximize square footage. “It’s expensive real estate,” Pierce says. Also consider how care and maintenance needs differ from farming in open fields. Plants that do not require trellising, staking, or regular pruning outdoors often benefit from those tactics inside a hoop house. Winter crops grow more slowly. In colder zones like Vermont, greens need to be planted by late August or September to reach maturity for a November harvest, Pierce warns. The plants then go dormant under row covers until increasing warmth and light perk them up again in February. While farmers do control hoop house water application—most often through a drip irrigation system—moisture must still be carefully monitored. In winter, water should be applied sparingly to avoid freezing plants, and row covers should be kept off leaves to minimize condensation, which can freeze. Throughout the year, proper ventilation helps control diseases that thrive in moist, warm, still environments. Vents also provide access for pollinators and other beneficial insects. As with field cultivation, hoop house production relies on crop rotation to reduce the risk of soilborne diseases and pests. For that reason, having at least two structures is helpful. Between hoop house growing seasons, remove plant debris and materials such as trellising or stakes to prepare for future crops. This article first appeared in the spring issue of New Farm Magazine, the magazine of Organic Farmers Association. All members receive a complimentary issue of New Farm. Join today. Melissa Pasanen is food editor of Vermont Life magazine and a regular contributor to Vermont Public Radio. Her work has been published in the New York Times and Saveur. Funding Support Go to nrcs.usda.gov and enter “Environmental Quality Incentives Program” in the search field for information about support for farmers who want to purchase hoop houses. You’ll find links where you can learn specifics about your state, including how to apply for funding. Pro Reports At the Sustainable Agriculture Research & Education service’s website, sare.org, click on “Season Extension” (under “Hot Topics in Sustainable Agriculture”) for detailed reports on buying, setting up, and using hoop houses. Best Practices Experienced growers share insights about hoop house construction and use at hightunnels.org, a collaborative resource developed by extension specialists from around the country. Why Join the Organic Farming Certificate Program?